Handmade features, hand-selected for you. For those who seek quality, experience and a little bit of luxury. Sleep should not be a luxury, but your bed can. When it comes to beds and mattresses in our Luxury range, the devil’s in the detail. From hand-tufting and flag-stitched corner wrap handles, to vents and rounded corner guards - designed to provide you with quality, luxurious sleep. 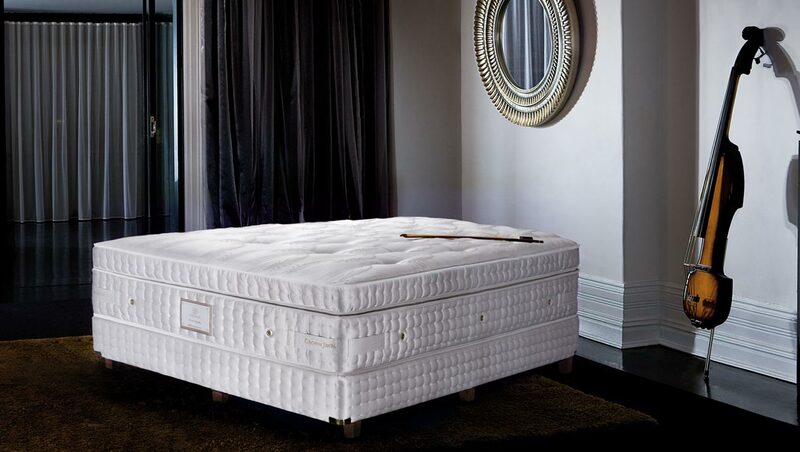 The Luxury mattress range features brands such as: King Koil World Luxury, Sealy Crown Jewel, Serta Avant Garde, Silent Partner and Aireloom. guarantees of up to 10 years on beds and 5 years on bedroom furniture. Pictured: Sienna bedframe in Zeppel MEGA SPA and side table in Ghost stain. Australian made with custom fabric and timber choices. When it comes to bedroom furniture, our Australian-made pieces are built to last for generations. Using the finest quality hardwoods such as Victorian Ash and Tasmanian Oak, they’re meticulously handmade using craftsmen techniques. Choose from various styles for ample luxury where you need it - designed to bring your bedroom to life. Our Luxury range is carefully sellected to use premium fabrics like silk, wool and cashmere.